I’m a big fan of the website design-milk.com and have been an avid reader and subscriber for some time. Today’s post, written by Caroline Williamson, absolutely blew me away, and got me so excited that I have to share it with you. I have seen some amazing clothing in the past couple of years designed and made by a 3D printer. For all of their beauty and intricate design, they have been rigid, sculptural and very armour like; in other words, not wearable. In today’s Design Milk post, I have seen what the future of fashion can look like, and it’s exciting. I’ve always been interested in how technology can advance the properties of clothing design, but that’s a whole other discussion for another post. Nervous System is a studio out of Massachusetts, that combines science, art, and technology to create their designs. 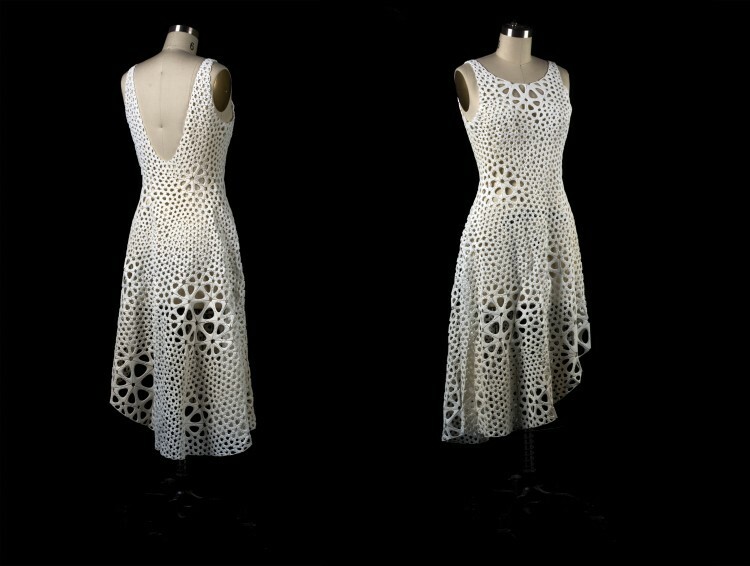 Their latest project used Kinematics – their 4D printing system that creates complex, foldable forms composed of articulated nylon modules – to make a dress. The system provides a way to turn any three-dimensional shape into a flexible structure using 3D printing. The dress is made from almost 3,000 unique, tiny articulated interconnected parts, that allow for the dress to move and conform to the body a lot like fabric, or more accurately like chainmail. Can you imagine creating a dress that comes out of a 3D printer with no assembly required and can be worn straight out of the printer? Wow, I can’t wait for the day I can us this technology myself to design and make my own clothing with a computer and 3D printer! MOMA acquired the dress and the software that created it for their permanent collection. Nervous System has released two web-based applications: Kinematics and a simplified version called Kinematics @ Home which is completely free to use. The Kinematics app allows for the creation of necklaces, bracelets and earrings. Users can sculpt the shape of their jewelry and control the density of the pattern and can be ordered in polished 3D-printed nylon in a variety of colours. The prices range from $31 – 61 UDS and take about two weeks to ship. The Kinematics @ Home app is for those who already have access to a 3D printer, allowing users to download an STL file for a bracelet from their website for home printing. You enter your wrist size, style your bracelet and click print to receive a free STL file suitable for printing on a Makerbot or similar desktop printer. Guess what I’m dreaming of asking Santa for this Christmas? The 3D Digitizer Desktop Printer from MakerBot is available on line for $799 UDS.